Helmuth, Keri, Ryan (our section leader) and Brian (aka Red Beard). It was possibly the most amazing summer anyone could have asked for because of some of the greatest people I have ever met and worked with. 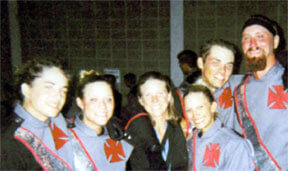 The 2002 Bones drum line/plate line will never be forgotten." Thanks Kelly! E-mail your Forzato submissions to dave@dci.org along with where and when the photo was taken, and send some biographical information about yourself as well. We'll give you full credit. Also, let us know if you want your e-mail address included, to get feedback from other drum corps fans.